How: A copy of this novel was provided by Harper Collins Australia for review. The Lady’s Guide to Petticoats and Piracy was one of my most anticipated books of 2018. After reading and absolutely adoring The Gentleman’s Guide to Vice and Virtue I was absolutely thrilled about the prospect of another book set in the same world, with the same characters. With the bonus addition of piracy. While The Lady’s Guide to Petticoats and Piracy was set in the same world with the same characters, there was absolutely no piracy. I honestly thought that this book would be set at sea, with the same pirates that readers met in Gentleman’s Guide. But that was not the case. There were pirate characters, and pirate ships, but there were no sailing the high seas and plundering merchant ships for their goods and wares. And for that, I was severely disappointed. When a book has the word piracy in the title I actually expect some, you know, piracy. Beside the massive letdown of no piracy in The Lady’s Guide to Petticoats and Piracy, there was also no discernible plot in this 400-odd page novel. To be honest, most of the book was Felicity bemoaning the fact that she was a girl, and that she was denied opportunities because of this. And yes, I am on board with moaning about men and their privilege, but I also need a little more than that. Also, the vehement reinforcement of the gender binary throughout this entire novel was, quite frankly, exhausting. Even though this was an historical novel I still don’t think that all discussions regarding gender had to be so blatantly binary. This series is a queer series after all so it just seemed remiss to focus so solely on cisgender identities. Perhaps I could have forgiven the completely lack of piracy and the absent plot if I had adored the narrator. I have fallen in love with books before simply because I love the protagonist so much that that love carries the whole novel. That was not the case for The Lady’s Guide to Petticoats and Piracy. Felicity was boring. There, I said it. She was boring and she was judgemental and I am just very tired of ace characters all conforming into the ‘smart and logical and ew what is human emotion get it away from me’ character archetype. It’s so very over used and I am so very over it. I was also expecting Felicity’s asexuality and aromanticism to be an important part of the novel since that aspect had been so hyped up, but there were less than a handful of passages about either and how she felt regarding them, and for that I was severely disappointed. 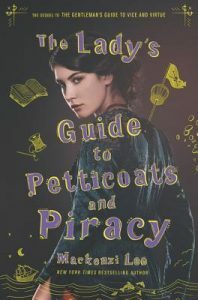 The best part of The Lady’s Guide to Petticoats and Piracy was the last 50 or so pages, when things actually happened and Felicity wasn’t a boring cardboard cut-out of a character. If the whole book had been as interesting as those last few chapters I think I’d be writing a very different review. But as it is, they were only the last 50 or so pages, and they couldn’t make up for the hundreds before them. All in all, I was disappointed in The Lady’s Guide to Petticoats and Piracy. I didn’t want to be. I wanted to adore this novel as much as I did its predecessor. But the things I detailed in this review were all the reasons why I didn’t and couldn’t fall in love with this book. Maybe you’ll have better luck with it, but for me it just didn’t quite hit the mark. © 2018, Chiara @ Books for a Delicate Eternity. All rights reserved. Amen! I gave it the same rating. I found the story quite erratic, did not like Felicity either and yes, no pirates at all. I admit the book has good moments but yes, I found the whole thing so erratic I could not love it more. It’s such a shame because I feel like it had potential, but it never really got there. When I don’t like the main character I find it hard to like the book :( I’m sorry neither of us liked it, Nina! Yes it had potential sadly for me it did not deliver! I’m sorry you didn’t love it, either! I agree the best parts were when Percy and Monty were around – they made it a lot better. It’s such a shame that her ace and aro-ness were so underdeveloped, I would have loved more about that, to be honest. Yeah, the lack of piracy devastated me!! Oh no, I’m sad this didn’t work for you! I’ve just started it today, and I’m not going to lie, I’m not exactly feeling it yet, but I’m hoping it will get better haha. I heard from various people that there is not really any piracy which is DISAPPOINTING – they shouldn’t have put it into the title then smh. Great review! I’m so sad, as well! To be honest I knew from the first few pages that it just wasn’t going to click with me :( I hope it gets better for you, though! I have no idea why piracy is in the title but not in the book >.> Thanks, Veronika! Omggg noooo. I’m so sad it disappointed you! I’m reading it right now but I’m enjoying it. 😂Although it’s not really rating anywhere near to Monty’s level of fantasticness. Eep. I’m actually struggling with the audiobook narrator though, because she makes Felicity sound much more vibrant whereas I LOVED how factually flat she was in Monty’s audiobook.😂Like all her “no you’re not dying” cue eyeroll every time Monty freaked out, were all delivered so stolidly haha. I loved that. But yeah. I was wondering when the pirates would start but gah, I’m sad they won’t. How disappointing! I haven’t read A Gentleman’s Guide yet, as I knew it was part of a series. I didn’t want to have to wait forever for the rest of the story! Sigh. I agree with you – ace and aromantic characters should have more than a complete lack of emotion. I’m ace and I am not a robot! Show some feelings, people! I’m sorry this disappointed you so much. Are there more books expected in this series? Perhaps you’ll find joy in further books? I don’t think there are any more! There’s just the two siblings and so just two books I think. I'm Chiara, & welcome to Books for a Delicate Eternity! 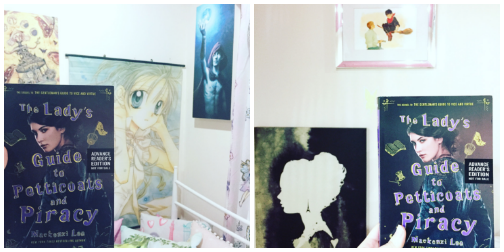 Here you’ll find posts on books, reading, life, art, & things in between (like cats). © 2013-2019, Chiara @ Books for a Delicate Eternity. All rights reserved. Please respect my original content.